The ignition must be switched ON and the headlights must be turned on. 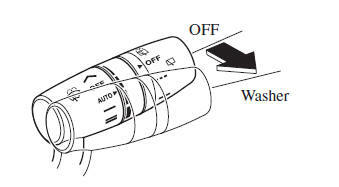 The headlight washers operate automatically once every fi fth time the windscreen washer operates. If you want to operate headlight washers, double fl ick the wiper lever. If air enters the headlight washer fl uid pipe under conditions such as when the vehicle is brand-new or after an empty washer tank is replenished with washer fl uid, washer fl uid will not spray even when the wiper lever is operated. Double fl ick the wiper lever several times until the washer fl uid sprays.